06:20:00 Makes 20 servings, 1 piece (112 g) each. Makes 20 servings, 1 piece (112 g) each. An elegant way to finish a party, this spectacular cheesecake is so very easy to make. Shhh, only you need to know. Line 13x9-inch pan with foil, with ends of foil extending over sides. Mix wafer crumbs, 1/2 cup nuts and butter; press onto bottom of prepared pan. Beat cream cheese and 3/4 cup sugar in large bowl with mixer until well blended. Add sour cream; mix well. Add eggs, 1 at a time, mixing on low speed after each just until blended. Dissolve coffee granules in liqueur; stir into batter. Pour over crust. Bake 45 to 50 min. or until centre is almost set. Meanwhile, bring remaining sugar and water to boil in small saucepan on medium-high heat, stirring constantly. Continue boiling, without stirring, 5 to 7 min. or until syrup is thickened and begins to turn golden brown. Remove from heat. Stir in remaining nuts. Spread onto parchment-covered baking sheet. 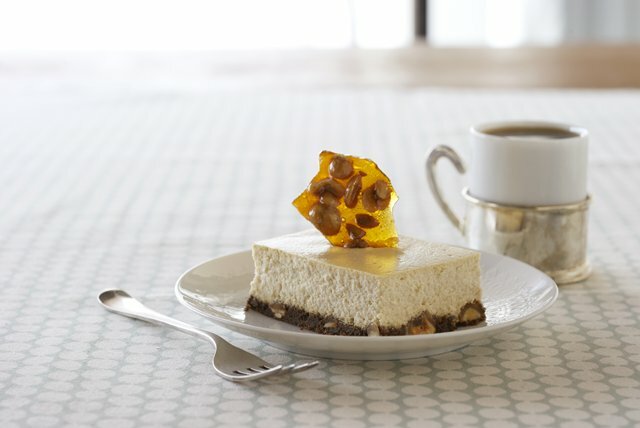 Cool cheesecake and nut brittle. Refrigerate cheesecake 4 hours. Use foil handles to lift cheesecake from pan before cutting to serve. Break nut brittle into 16 pieces; place 1 on top of each cheesecake piece. Place completely unwrapped packages of cream cheese in microwaveable bowl. Microwave on HIGH 30 to 45 sec. or just until cream cheese is softened. To easily toast nuts, spread them in single layer in shallow pan. Bake at 350°F for 5 to 10 min. or until golden brown, stirring occasionally. To crush wafers without using a food processor, place wafers in large resealable plastic bag. Press bag to remove excess air before sealing bag. Then crush wafers with rolling pin. If cooking the hazelnut brittle on a gas stovetop, be sure to reduce the heat setting to medium to prevent the hazelnut mixture from burning. Serving Size Makes 20 servings, 1 piece (112 g) each.